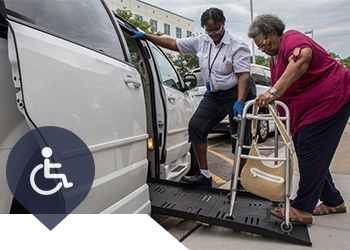 Giving our clients the independence they deserve by delivering paratransit for quality of life needs such as medical appointments, work, school and entertainment,A-Para Transit takes pride in providing the highest quality of customer care. A-Para Transit has been in the business of providing paratransit services for over 20 years. This breadth of experience makes A-Para Transit a go-to source for innovative, cost-effective and efficient solutions for all types of paratransit service. Our vehicles are equipped with AVL/GPS devices, which allows our dispatchers to pinpoint the exact location of our vehicles. In addition, vehicles are equipped with mobile data computer (MDC) tablets, which improve driver / dispatcher communication and enhance on time performance. A company-wide culture of safety is paramount to any transportation service.A-Para Transit has made a significant investment in comprehensive training and safety programs designed to ensure that drivers and all other support staff understand the procedures and practices that promote safe operationson every contract.Communicating the expectations and strategies we and our clients have for providing clean, comfortable and reliable service to all customers, including seniors and people with disabilities, is the primary goal of our training programs. A-Para Transit’s training program provides training in all areas of transit operations, including federal, state, company and contractual requirements, safe vehicle operations, customer service and passenger awareness and sensitivity, accident and incident procedures, and service policies and procedures. A-Para Transit will maintain documentation of all training provided and will ensure that each employee’s training file shows all training which that employee has received.